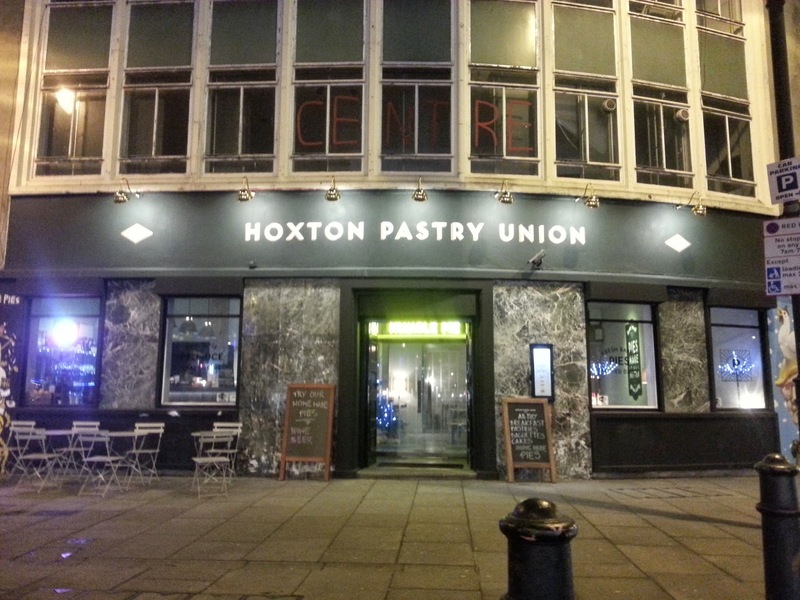 Pierate - Pie Reviews: Do pies make it all better at Hoxton Pastry Union? 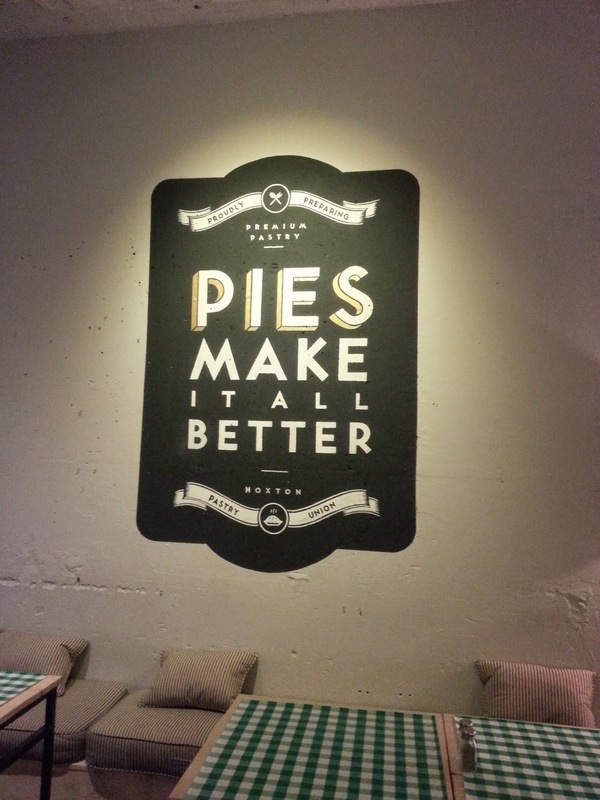 Do pies make it all better at Hoxton Pastry Union? 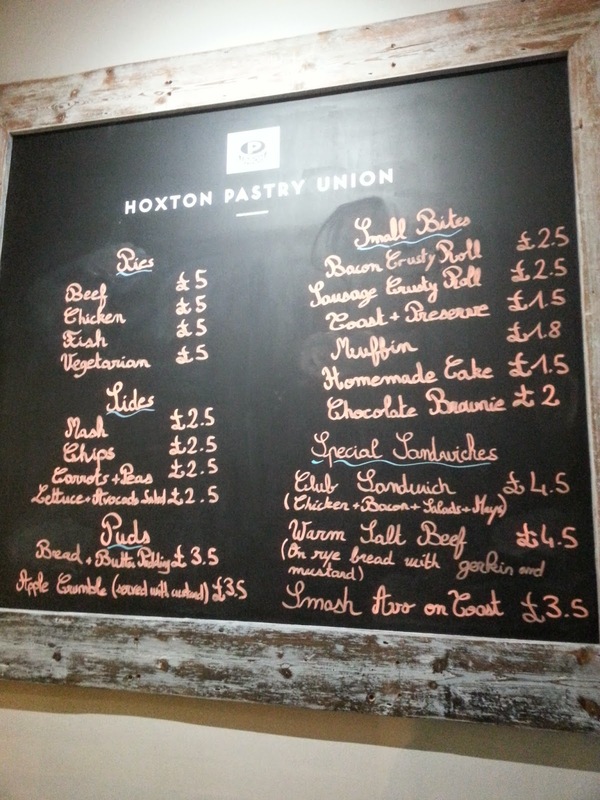 Introducing to you the new eatery in Shoreditch - the Hoxton Pastry Union. This sizable pie establishment has been open near London's Old Street for little over a month, but I felt it was definitely time I walk through its doors and check out what pies are on offer. Okay, so the menu actually only has 4 pie options on it. For a shop called the "pastry union" you might expect a slightly wider variety of pies - but I guess I'm just glad they're serving pies in this joint and not pasties, slices or other non-pie pastry goods. The description of each pie is rather brief. "Beef", "chicken", "vegetarian" - these aren't particularly descriptive or enticing terms. I would prefer the pie filling is described to me in a little more detail - perhaps with a name for the pie - so I can be excited by it. When I'm spending £5 on a pie, I'd like to know what's in it without having to ask the bar staff. I'm tempted by the fish pie, quite simply because I'm curious to see whether it is actually a full pastry pie, but on the waitress' recommendation I opt for the chicken pie. No sides, thank you. Yes, gravy please but in a separate container. As I wait for my pie to be cooked, I spot a wonderful sign on the wall. That's brightened up my work day. Pies do make everything better! 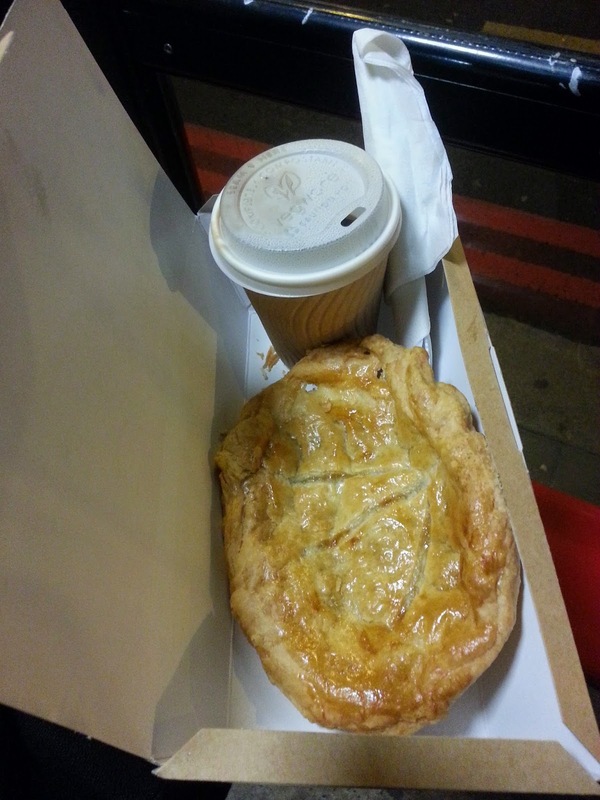 And here is the pie, in a take-away container. I would eat it in the shop on one of their funky tables, but I must dash. The pie is golden in colour - a little more yellowy than I am used too. The lid has a nice shiny glazed surface. The pies are obviously hand-made, which is good, but I would have liked to have seen a bit more attention paid to the condition of the pie - some nice crimping, for example, would have been a good addition. When I cut the pie open, I note that there is a rather underwhelming amount of filling. The photo below shows one half of the pie, showing you the lack of filling. The other half of the pie was more filled than that, but I struggled to get a good photo as my hands were full. However, this photo does highlight the rather disappointing amount of filling. There were only a few chunks of chicken in my pie - personally I would have expected more filling for the price I paid for this pie. On tasting, I noted a lovely taste of tarragon and mushroom along with the chicken. In my opinion the filling that was there certainly tasted nice, and the chunks of chicken were high quality with no gristle or chewy meat.. 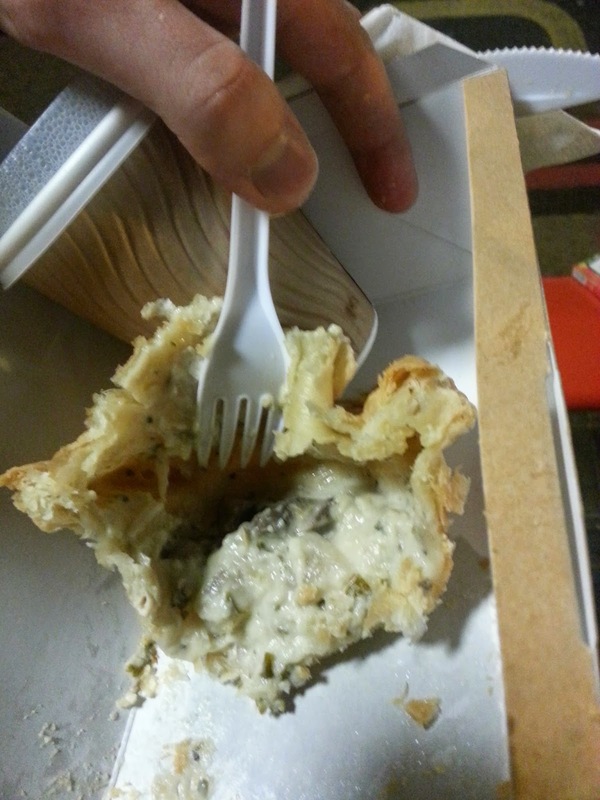 The pastry lid was nice and crispy, but the base and sides were rather soggy and floppy. I initially tried picking up this pie with my hands but I had to put it down again as it felt as if the base was going to break apart. This pie initially looked large, but actually it felt like this was an illusion - once you got past the pastry lid, the pie was rather shallow and underfilled. My appetite wasn't sated after one pie. You can make up your own mind, and maybe their other pies are better (and I got a dodgy one), but I personally won't be rushing back to Hoxton Pastry Union. That said, the gravy was actually delicious! Some of the best I've had.